The Palestinian Prisoners Society, on Thursday morning, said that Israeli authorities informed the family of Yassim Al-Saradih (33) of his death, hours after he was taken form his home the same day. The family assured that Yassin was violently beaten during the seizure, and that he did not suffer from any diseases. Later, CCTV cameras showed the violent beating of Saradih by Israeli soldiers during the arrest, adding that he inhaled teargas and suffered from cramps due to the pain. Israeli occupation forces stormed Jericho at dawn today (2:30), where clashes broke out between the youths and soldiers. PNN further reports that the Palestinian Center for Human Rights (PCHR) called for immediate and impartial investigation into the circumstances of his death, expressing concerns that the Israeli forces might practice torture against him immediately upon his arrest and this would be the reason behind his death. According to PCHR’s investigations and eyewitnesses’ accounts, at approximately 04:30 on Thursday, 22 February 2018, Israeli forces moved into Jericho. They raided and searched a house belonging to Khamis Hattab in the center of the city after breaking down the main house door in addition to damaging some of the house contents. His nephew, Yassin ‘Omer al-Saradih (33) headed to the house to figure out what was going on. However, immediately, a number of Israeli soldiers severely beat him up throughout his body and then fired a tear gas canister on the spot. They then pulled him on the ground to a military vehicle and later to an unknown destination. At approximately 09:30 on the same day, the family received a phone call from the Palestinian Military Liaison telling then that the Israeli Liaison informed them of the death of their son due to suffering gas inhalation and seizures. 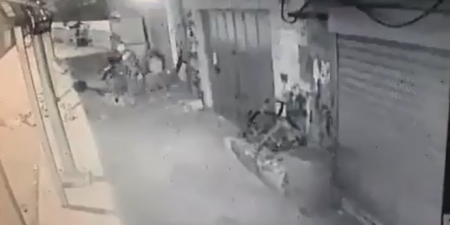 A video captured by a surveillance camera showed 6 Israeli soldiers attacking the abovementioned civilian and brutally beating him up using their riffles’ butts and feet. His family said to PCHR’s fieldworker that their son had not suffered from any disease before his arrest. It should be mentioned that the Israeli authorities detain the corpse and have not so far handed it to the family or the Palestinian competent authorities. PCHR emphasizes that during their arrest, Palestinian civilians are subject to severe beating, physical and psychological torture, and inhuman and degrading treatment.